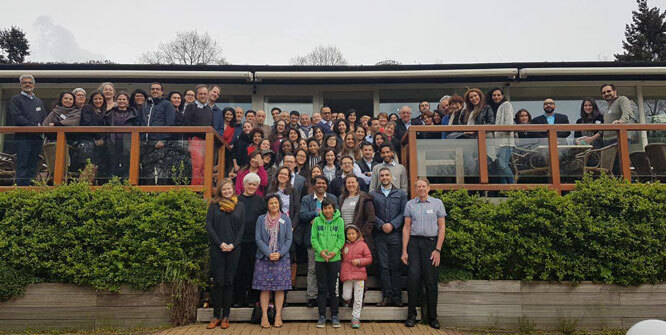 The 21st International Environment Forum Conference was held in partnership with the Justice Conference in de Poort, the Netherlands, on 14-17 April 2017. 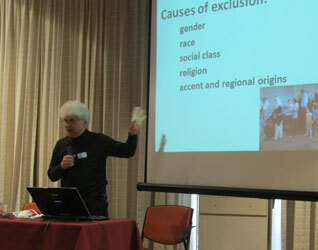 The theme of the Justice Conference was "From Disintegration to Integration: navigating the forces of our time". This report is not comprehensive, but only features the International Environment Forum events and a few other highlights. The opening plenary included the screening of materials from the Quiet Genocide project, documenting the decades-long persecution of the Baha'i community in Iran. "Environmental Changes as forces for disintegration and integration"
Human pressures are causing extreme climate change and the sixth mass extinction, among other environmental catastrophes. These manifestations of disintegration in ecosystems and the entire earth system require compensating efforts of integration including global environmental governance. Nature demonstrates the complementarity of disintegration and integration. Similar processes operate in human society, and systems science helps to explain their relationship. Higher levels of human integration may depend on ethical values including from religion. Climate change provides an example of the need for innovation in integrating different societal dimensions such as science, education and governance. 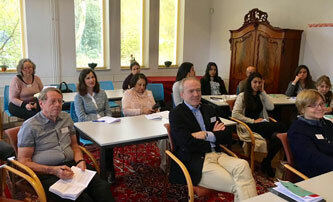 This workshop explored a set of topics linked to this theme through presentations and interactive discussions. The first presentation was on Environmental Changes as forces for disintegration and integration by Prof. Laurent Mesbah of the American University in Sarajevo, Bosnia and Herzegovina. He showed how nature offers beautiful examples of disintegration and integration as organic processes, at the molecular, cellular, organism, species, population, community, and ecosystem level. All living processes are essentially organic and follow precise and beautifully regulated natural laws, such as seasonal cycles. Spring is a physical rebirth of organic matter and life, as well as a symbol of renewal or rebirth used in many cultures and old traditions maintained througout the ages. The son of the founder of the Baha'i Faith, a great thinker and wise man 'Abdu'l-Bahá, wrote: "Reflect upon the inner realities of the universe, the secret wisdoms involved, the enigmas, the inter-relationships, the rules that govern all. For every part of the universe is connected with every other part by ties that are very powerful and admit of no imbalance, nor any slackening whatever“. If we look at the forest ecosystem for example we can see a disintegration of dying living organisms and materials such as leaves in the fall from which decomposers feed. Decomposers such as insects, fungi and bacteria actually thrive on this abundant source of energy, and provide nutrients from which green plants will benefit, build material and store energy captured from the sun. Decomposers such as insects in turn become a source of food, for example, for forest insectivore birds who in turn can also become a prey for other predators, connecting other organisms through the food chain and food web in the forest ecosystem. In this and all other ecosystems integration and disintegration are therefore very tightly connected and interdependent. What can we say about human societies and these forces of integration and disintegration? We do have significant evidence of important negative impacts on the natural environment. The impacts of humans on planet earth have become so profound that scientists call this time the Anthropocene era. The disintegrating processes which include climate disruption, biodiversity loss, habitat destruction and unsustainable use of natural resources constitute a real crisis and threat for humanity and for many forms of life. Human societies themselves are facing many crisis such as inequalities, financial, social, and all kind of injustices today are adding to each other and seem to be interconnected. Perhaps if we look at the root causes of these crises we could understand how these disintegrating forces can provide the driving forces needed to build more just and sustainable human societies in better harmony with their natural environment. 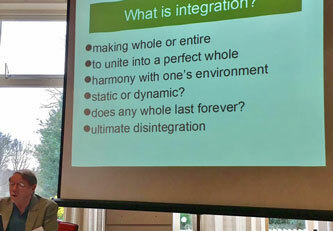 In the second presentation on The Systems Science of Disintegration and Integration, Dr. Arthur Lyon Dahl of Geneva, Switzerland, asked what is integration? It is making whole or entire, to unite into a perfect whole, or harmony with one’s environment. But is it static or dynamic? Does any whole last forever? Ultimately everything disintegrates. There are cycles of integration and disintegration. Stars are born and die, our body grows and deteriorates, religions are born and decline, civilizations rise and fall. What are the qualities of a young integrating system versus an old disintegrating one? Flexibility versus rigidity, innovation versus resistance to change, diversification versus rejecting differences. In a highly integrated system like a coral reef, we see cooperation, symbiosis and complementarity; inclusiveness; efficiency of exchanges, communications and networking; increasing capital stock, economy in resource use, efficient cycling, little waste; high energy capture and effective use of its flow through system; and high diversity and specialization of functions. What causes disintegration? There are internal causes like imbalances escaping from homeostatic mechanisms, failures in resilience, rigidity and overspecialization, inadequate diversity leading to instability, and accumulation of disfunctions with age. There are also external causes such as changing environmental conditions beyond the limits a system is adapted to, sudden shocks or damaging events, competition from a more dominant system, and conditions creating new potentials for which the system is not well adapted. Peter Turchin (Nature 7281:608, 4 February 2010, doi:10.1038/463608a) has modeled the rise and decline of civilizations mathematically, using social cohesion versus collective violence as an indicator. He found that population growth and new technology generate wealth for the elite, until an oversupply of labour increases poverty and allows the concentration of wealth, resulting finally in factionalism, anarchy and collapse on about a 200 year cycle. He predicted political instability and impending crises in Western Europe and the USA peaking in 2020, and highlighted the need to reduce social inequality. Complex systems do not usually follow a smooth evolutionary curve towards greater integration and complexity, but experience what is called a punctuated equilibrium, with periods of stability interrupted by times of rapid change with bursts of creativity and reorganization. Dominant entities like the dinosaurs that have over-specialized and have lost the capacity to adapt die out, to be replaced by entities capable of rapid change and with new potentials for increased efficiency and integration (think early mammals). Human social systems seem to follow a similar pattern, and recent research suggests that higher levels of human organization can only be explained by the ethical principles of religion (Turchin, Ultrasociety, 2016). New values are the catalyst for a new cycle of integration. The present time, with accelerating disintegration of the old system and embryonic development of the new more integrated system of a planetary civilization, would call for learning communities accustomed to a culture of change and founded on strong spiritual principles. 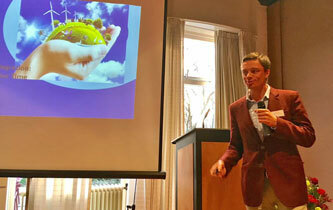 Dr. Joachim Monkelbaan of the Transitions Hub of Climate KIC in Brussels, Belgium, followed with a presentation on Systems innovation for climate change. He started by reviewing the forces for disintegration and integration. The first force, technology, has brought us closer together, but also has led to cybercrime, new weapons, smartphone over-use, social media polarizing through confirmation bias, dissemination of ‘fake’ news, and destruction of jobs. The second force is globalization, the international integration arising from the interchange of world views, products, ideas, and other aspects of culture. But most jobs are lost to productivity increases rather than trade and delocalization. We worship growth, but it has only benefited the workers in China and the very rich, not the very poor or the middle class. The third force is climate change, which the US military and intelligence consider a threat to national security. The transitions necessary to respond to rising population, affluence and climate change require systems innovation. Complex systemic problems require envisioning the future or backcasting; learning, reflexivity and adaptiveness; systems thinking to address complexity and realize transformational change at scale; participation involving stakeholders to affect the way systems work; and serendipity to leverage crisis for purposive or compulsory decision-making. Innovation is usually perceived as technical rather than about social change but the systems perspective obviously shifts that perspective. Integration is important at the science-policy-practice interface and in education. Bahá'í principles can shed new light on these issues. Since humans are fundamentally spiritual beings and are multi-dimensional, we need an understanding of behavioural, psychological, and spiritual aspects, and a revolution in awareness to modify the human behaviour that drives climate change. Bahá’ís are encouraged to see in the revolutionary changes taking place in every sphere of life the interaction of two fundamental processes. 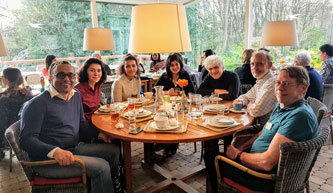 One is destructive in nature, while the other is integrative; both serve to carry humanity, each in its own way, along the path leading towards its full maturity (Universal House of Justice, To the Bahá’ís of Iran, 2 March 2013). This is nothing new. In Taoism, the interaction between Yin and Yang, between integration and disintegration, is taken to produce and change the universe, to create being and non-being. In the final presentation on The promises and pitfalls of integration in governance, Asst. Prof. Sylvia Karlsson-Vinkhuyzen from Wageningen University, the Netherlands, showed how integration emerges frequently in current discourses on governance. The increasing functional interdependencies between traditionally separate policy areas such as energy, agriculture, health etc. leads to calls for integration in policy and implementation. Concepts such as environmental policy integration and mainstreaming of the environment appear in development plans and policy papers of national and international organizations. The Sustainable Development Goals and the Agenda 2030 in which they are embedded are explicitly 'integrative’ and ‘indivisible’ among its 17 goals and 169 targets, many of which are synergistic while some are clearly antagonistic. She started by discussing problems in international governance such as mainstreaming fatigue, prioritization conflict, trade-offs, and accountability constraints. She then cited promising principles such as becoming protagonists of our own development: “care must be taken lest people be treated primarily as passive objects to be developed, rather than as protagonists of development in and of themselves” (Baha’i International Community, Summoning our Common Future, 2015). The most important principle is that “the purpose of Justice is the appearance of unity among men” (Bahá'u'lláh). It is essential to redefine fundamental goals: “...it is clear that the honour and exaltation of man must be something more than material riches. Material comforts are only a branch, but the root...is the good attributes and virtues which are the adornments of his reality...” ('Abdu’l-Bahá), and to internalize responsibility: ...the love and knowledge of God, universal wisdom, intellectual perception, scientific discoveries, justice, equity, truthfulness, benevolence, natural courage and innate fortitude, the respect for rights and the keeping of agreements and covenants; rectitude in all circumstances, serving the truth under all conditions, the sacrifice of one’s life for the good of all people; kindness and esteem for all nations...” ('Abdu’l-Bahá). 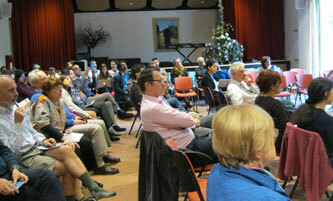 The workshop concluded with a general discussion on the main theme. In the Saturday morning plenary, Vincent Cillessen of the War Crimes Unit of the Dutch Police provided perspectives from a National War Crimes Unit: Tools to Fight Impunity for Syrian War Crimes outside of the International Criminal Court or an Ad Hoc Syria Tribunal. He described the activities possible at the national level to document war crimes in an ongoing conflict with the aim of the eventual prosecution of war criminals. Four parallel workshops followed. In one, Prof. Graham Hassall from Victoria University in Wellington, New Zealand, spoke by video link on "Justice and Global Governance: A view from Oceania". 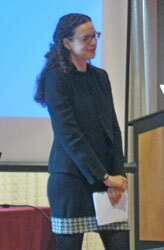 The afternoon plenary featured Simin Fahandej from the Baha'i International Community in Geneva, and Drs. 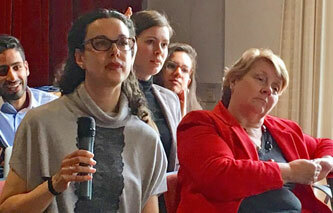 Marjolijn Snippe, For a Friendly Planet, speaking on "Governance by International Institutions and Global Democracy through the United Nations". Parallel workshops continued in the afternoon. The Sunday morning plenary by journalist and journalism professor Corinne Podger speaking by video from Melbourne, Australia, was on "The Mirror of the World: Perspective on the Modern Media Environment" in which she discussed the impact of Internet media on responsible journalism. She highlighted the challenges of finding trustworthy sources of news, when there were commercial interests in supporting confirmation bias, false news, and alternative truth. She also underlined the risks to professional journalism as advertizing revenue moved from newspapers and news broadcasters to free social media and people were no longer willing to pay for reliable news. In a second plenary on "Two Billion Eyes: Bringing Vision to Millions of People Requires Everybody's Participation", Kathleen Holmlund and Bijan Aazami described the latter's efforts to provide cheap glasses to the one billion people who cannot access education or participate fully in society because of poor eyesight. 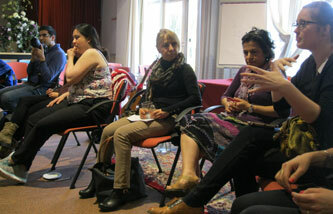 This was followed by a sharing of personal stories about the justice challenge. The afternoon plenary was on the "The Women's Movement and Use of International Legal Instruments" by Zarin Hainsworth of the United Kingdom, followed by further parallel workshops. The final plenary of the day was by Dr. Moojan Momen (U.K.) on "Islam and the West", tracing the rise and fall of a rational, tolerant Islamic civilization and the eventual transfer of science and reason to an emerging more secular West. The evening featured a projection of excerpts from Yann Arthus Bertrand's film "Human" followed by a discussion led by Carmel Irandoust on the reactions it produced and their ethical implications. 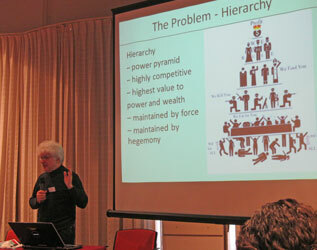 The final morning of the conference featured a second brilliant plenary talk by Moojan Momen on "Power and the Baha'i Community", contrasting the problems that have resulted from the hierarchy, hegemony and patriarchy of the present system in which power is maintained by competition, wealth accumulation and force, and the Baha'i approach in which there is no contention for power, power is with institutions rather than individuals, decisions are made through consultation, and the system is built through a practical path with programmed action and participation in a culture of learning. 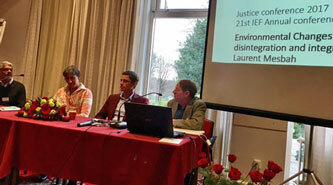 After a final set of parallel workshops, conference organizer Maja Groff (The Netherlands) reviewed conclusions and outcomes from the Justice Conference for building integrated communities. Born and grew up in France in a multicultural background, Laurent Mesbah did research and teaching in plant genetics at the Free University in Amsterdam, the Netherlands, where he completed his PhD. In addition Dr Laurent Mesbah completed a certificate of advanced studies in Environmental Diplomacy at the University of Geneva and is member of the International Environment Forum since its foundation. Laurent has been living in Bosnia and Herzegovina since 2000 with his family. He has been involved in education and youth empowerment as well as in managing, implementing and evaluating projects related to sustainable development with international organisations. Laurent teaches environmental sciences and value based leadership at the university and co-founded and leads Bloom Earth School in Sarajevo. Dr. Arthur Lyon Dahl is President of the International Environment Forum and a board member of ebbf - Ethical Business Building the Future. A scientist by training, he has 50 years' experience on sustainability, international environmental governance, development, indicators, and systems science. A retired Deputy Assistant Executive Director of UNEP, he lived and worked many years in Africa and the Pacific Islands, and consults with the World Bank and UNEP. His recent work includes values-based education for sustainability. His books include: "Unless and Until: A Baha'i Focus on the Environment" and "The Eco Principle: Ecology and Economics in Symbiosis". 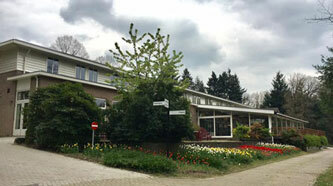 Joachim Monkelbaan, has recently been named manager of the Transitions Hub of Climate KIC in Brussels, Belgium. He has degrees in law and recently completed a Ph.D. at the University of Geneva looking at international governance for the transition to sustainability. 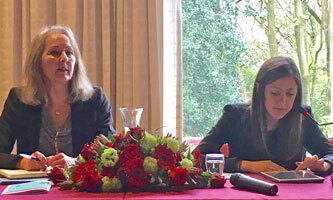 He previously worked for IUCN, UNEP and the International Centre for Trade and Sustainable Development. 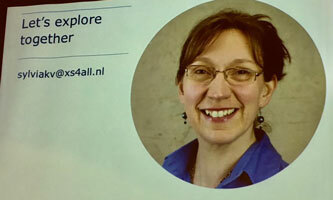 Sylvia works as Assistant Professor with the Public Administration and Policy Group of Wageningen University since 2011 and is also Adjunct Professor in Global Environmental Governance with the University of Helsinki, Finland. Sylvia’s in her research seeks to understand the key determinants of what makes global governance processes with environmental and social implications exert influence and build legitimacy where issues such as transparency, participation, accountability and equity are important. She has published on the domains of global energy governance, global climate change governance and global sustainable development governance – particularly the evolution and legitimacy of international norms. She is a senior research fellow of the international Earth System Governance Project, a board member of the IEF, CIVICUS and One World Trust.